Take in a local cooking class during your stay with us in Caloundra on your next Sunshine Coast holiday. You don’t need to be an expert chef – you just need a desire to learn how to cook with local fresh produce and enjoy indulging in great tasting food. 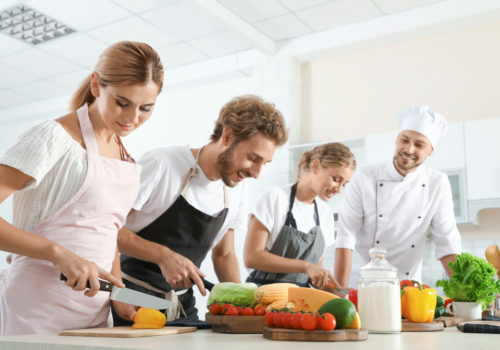 Select from a variety of Sunshine Coast Cooking Classes that all have something different to offer, depending on your taste. “Licensed to Spice” Cooking Classes are held locally here in Caloundra. Spend a fun morning learning about various cuisines from around the world, in particular about the herbs and spices used in each cuisine. It’s all about the spice! Then, sit down and relax with a beer or a wine over lunch, eating the food that you have prepared and cooked throughout the morning. After you have completed cooking, you will be able to sit down and enjoy each dish you have created, in a lunch or dinner setting. The Sunshine Coast’s first plant-based cooking workshops will empower you to feel confident in preparing simple and nutritious meals for the whole family – and build yourself a repertoire of delicious recipes! Whether you’re a competent cook or simply want a basic understanding of Asian ingredients and cooking methods, a hands-on Spirit House cooking class is a great way to meet new people, learn new skills and have an enjoyable day out which includes lunch/dinner and wine. The Tamarind Cooking School offers the opportunity to learn the intricacies of a range of cuisines from expert chefs in a state of the art cooking school, overlooking inspirational gardens in the heart of a beautiful rainforest. Long course cooking classes run for 4 hours from 11:00am – 3:00pm every Saturday at $165 per person, including apron, lunch and wine. Short course demonstrations run for 2 hours from 11:00am – 1:00pm once a month on Sunday at $45 per person, including tastings. Cooking Classes consist of different international cuisines such as Thai, Italian, South East Asian and French. Take some time out and become an expert cook during your stay in Sunshine Coast accommodation at the stylish and luxurious Monaco Resort Caloundra. Offering a selection of self-contained apartments and great facilities including Alfresco BBQ Area and an onsite café for your dining convenience and pleasure! To view our rates and make booking please CLICK HERE. View apartments currently for sale with the Onsite Manger.